Methimazole is a drug used to treat hyperthyroidism, a condition that usually occurs when the thyroid gland is producing too much thyroid hormone. It may also be taken before thyroid surgery to lower thyroid hormone levels and minimize the effects of thyroid manipulation. 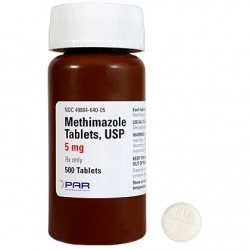 Methimazole is also used in the veterinary setting to treat hyperthyroidism in cats.